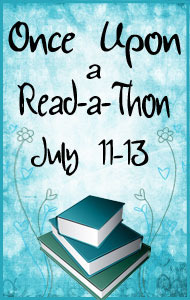 Today is Day 2 of the Once Upon a Read-a-Thon! I am still slacking, though. Last night, I came across some new crafty websites, and I have been planning lots of upcoming projects for the last few hours. Ah, well. At least I've enjoyed everything I've read so far! 3:00 PM - I picked up Sharks and Boys by Kristen Tracy this afternoon and read the first half or so in the tub. (I found this very fitting, considering the watery setting!) It's been a little slow going, as I'm not a huge fan of Enid, but it's starting to get interesting. I'm headed off to my internship now, but hopefully I will get back to reading this evening. 11:00 PM - Well, it wasn't what I was planning, but I checked out a copy of Collaborative Quilting by Freddy Moran and Gwen Marston at work and promptly fell in love with it. Moran loves color the same way I do, and her quilts are such an inspiration. I can only hope that one day I'll be half as good as she is! Off to bed for now. Hopefully tomorrow will be a more productive reading day (although it probably won't, as I'm checking out a new fabric store and will likely be unable to tear myself away from the cutting table and sewing machine for a few hours).